The Travel Bog Diaries. Thrown Out of a Yoga Class In India. 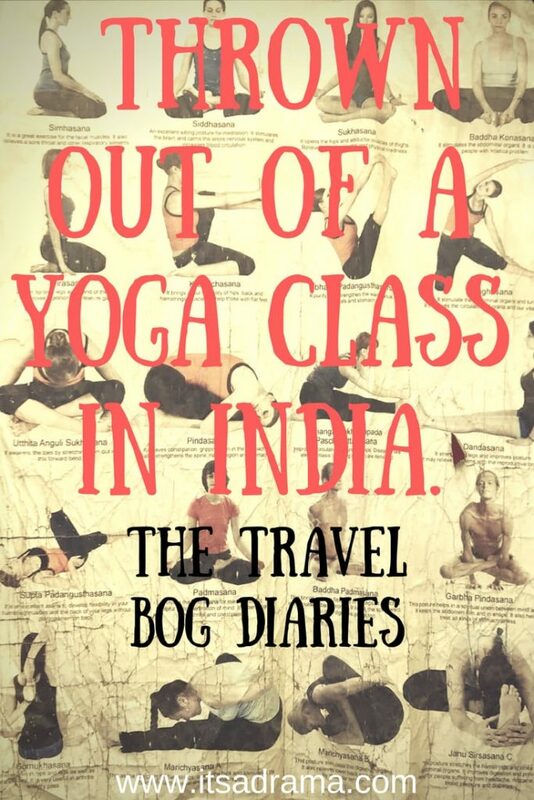 I couldn’t do the first without being reported to the police by my teenagers, the second was proving impossible in India, and so that left the yoga. Something I’ve been threatening to do for years but have somehow always talked myself out of it. After having just spent two weeks in Gokarna, where it seemed that every woman and her soul mate is super chilled out and zenned up to their eyeballs, I decided that when we got to Rajasthan, I too would head to the yoga studio. Like all of these other women. Get me some of this super magic bendy body mind power that these Mother Earth women are raving about. Then I would surely be perfect and kind, and my kids might decide that they hate their phones and would stop asking me to buy them Nutella. Why not? I thought. Go for it, Liz. You’re never too old to try something new after all. I first witnessed the perfect yoga family seated at the table next to us at the only decent restaurant in Gokarna. The family, who, had probably come from the Netherlands. Who had trecked across the desert and through a jungle with just a leather thong between their toes and a pendant around their necks containing buddhas eye to lead them… To me. And the kids and Brian. Sitting next to us in the cramped, hot and hectic restaurant I could tell from the outset that they were a family who never argued. Or even talked loud. They just whispered. And if this family were ever to raise their voices above two decibels, it would be for a jolly good reason. It would be to preach about the goodness of being vegan or the benefits of bathing in Almond milk and cow wee. The family that only see beauty in the world and vegetables and untreated soil. And cow pats. The family born in Tranquilum. I wanted that family. I would have smiled and greeted them warmly, but I was too busy trying to keep my hands from around Tessa’s neck when she had once again announced that the only thing she would be eating was chow mien. There is curd, okra curry and green pea soup, but no. All the way to India to eat bloody chow mein. The perfect family had two children. Just like us I thought. But nothing like us I thought. The older child was a boy whose hair had never seen a brush in its whole six years of being born. He wore a turban tied between his legs – like Mogli. And the younger child was pinned to his Mothers chest. Held captive by one of those khaki green slings. Arms and legs spread eagle with his nose all squashed. The Earth Mother. In her cheesecloth pale yellow teeshirt and wearing no bra. Not even a strapless one. Laughing at her child and talking to him. Listening. For real. Not even fake listening. And the Dad. The Dad with a hessian sack sewn with camel hair into a pair of trousers. Sporting a bare chest and lots of those orange beads around his neck that surely symbolise wisdom and goodness and just generally make you a better person who loves henna. I looked at Brian in his Liverpool FC top. And tried to imagine him casting it aside (carefully though. It’s this seasons and costs a fortune) in favour of a bare chest and a long set of nana beads. No. They’d only get all sticky and stuck in his chest hair when his belly started to sweat. The little Mogli boy ordered a Dahl soup and the mother, stroking his matted locks looked on with a serenity that made me want to scream ‘get some Vosene Conditioner on that kid’s hair and give it a good brush through’. “Yummy isn’t it my darling” she coos. I’m sure I saw her shift her gaze sideways to Tessa, picking out the long green vegetables from her monosodium glutamate Chinese dish. I think that’s what she said, but she might just have been asking the waiter for a drink of water. I looked over and smiled. Raised my already wrinkled with frett forehead as if to say “Frigging kids eh?” But she stared straight past me in horror and rested her gaze on Sonny who was asking Brian to hotspot him on the wifi so he could play mortal combat. The one time I want my family to stay silent. The one time I wanted to pretend to Mother Earth that I too had it all under control. That even though we looked like a family on the brink of a nervous breakdown, we were a very close and happy bunch. We didn’t always behave like this I wanted to say. We very often discuss the relevance of Shiva’s third eye and whether or not joss sticks are toxic. I wanted to tell her that I too breastfed and homeschool. Surely that counts for something? I want to impress her with the fact that we have cows in the field next to where we live and sometimes we even stroke them. But instead, I sat hunched over and watched in disgust as Sonny spat on his Mozie bites. “I have x-ray vision and I can see the rotting flesh of chicken and rum in your bulging stomach. I can count twenty-three lines on your forehead, and I know my seventeen times table. And my mama never, ever says ‘oh piss off under her breath’. With my paranoia running wild, I vowed there and then that things were about to change. I silently promised myself that once I got to Rajasthan, I would seek out a teacher and would indulge in yoga. Then my family would resemble this idyl of calm and have dirty hair. On arrival at Udaipur two days later, Brian and I were exploring the streets early in the morning while the kids were still slobbering in bed. I saw it. Gleaming. Sitting amongst dust and phlegm. The Yoga class sign. Tonight 7 until 8. There it is. Not quite as shiny and as glamorous as I’d expected but hey ho. This is India. Perfect. I felt the tension beginning to mount in Brian’s shoulders as he spotted me eyeing the sign. I ignored him. I find that’s the best way to deal with these marital differences. I announced to him that I would be attending the yoga class every night for the duration of the stay. Brian. Always careful about the way he approaches subjects like this. “You can’t live without your alcohol.” Maybe a tad harsh I think. He has a point. After all, the rum and cokes are all he and I get to enjoy. Alone. Brian has already zoned out and is checking the football scores on his phone. I want him to be like Daddy Earth and implore me to elaborate on how I feel, but instead, he blows into his iPhone 7 about ten times, shaking it like a lunatic. Complaining that Sonny has been using his chargers with dirty hands and now his headphones don’t work properly. I trot back to the hotel to inform the kids that Mummy won’t be available for chats and cuddles tonight as she will be attending an Indian yoga session. There. Not quite the start to the day that I had in mind, but at least there were no tears. Always a bonus. I stand up to my full height. Reminding myself that I won’t be very good at Indian yoga if I continue to hunch over like an old hag. The body, after all, reflects that of the mind Liz. 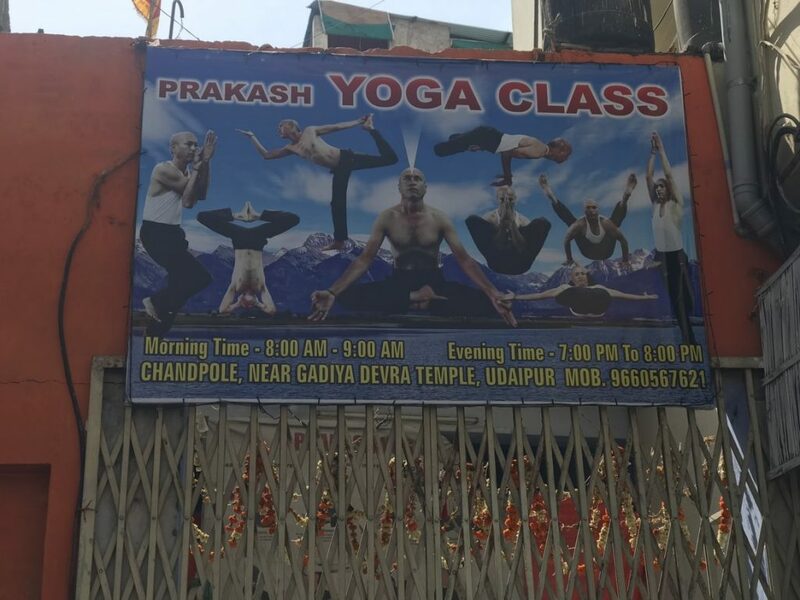 All day I was nervous about my Indian yoga class. I was starting to regret that I’d told the kids. Having earlier asked Tessa to come with me in the hope that we could have some yummy natural bonding time together as mother and daughter she had said “No way! That’s just freaky. A load of women sending their baby back to the womb” and then walked off laughing. It was my kids source of entertainment for the whole day. Sniggering to each other about how I’d have to put my legs around my head and wouldn’t be able to get them back into place again. 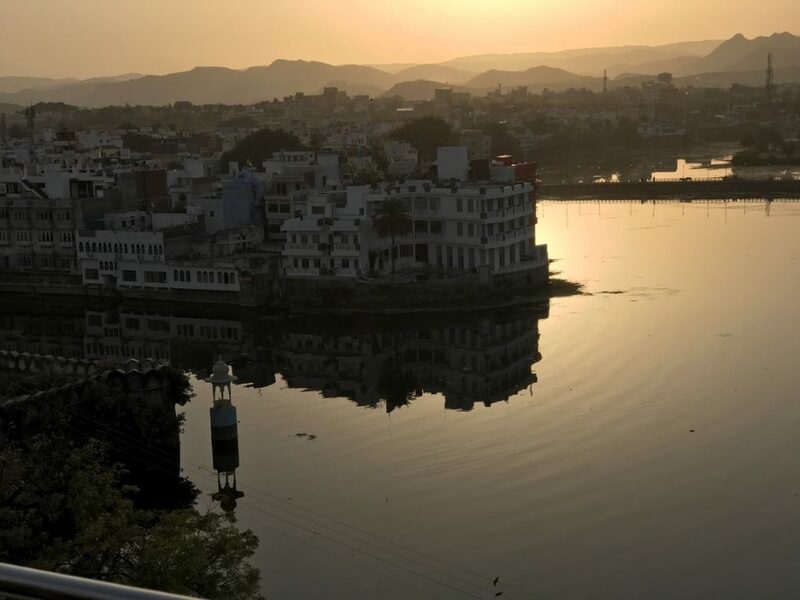 I wanted to retaliate and scream down through the streets of Udaipur: ‘I’d like to send you two back to the womb you cheeky little buggers’ but the man that we had just met from the art shop was looking at me, and he thinks I’m really nice, so I didn’t. Go to yoga and you too will be calm and nice and have a light shining out of your head. Seven o’clock came around all too quickly. And I’ll admit. I was tempted to throw the yoga pants back into the dirty backpack and pour some dark rum down my throat instead. That would surely make mummy a more beautiful person for a few hours. But I was strong. An excellent example to my children who were pushing me out of the door to see if I would go. Goading me. Sniggering. I knew. I knew the minute I entered the whitewashed building that something didn’t feel right. It was at that moment that I realised that I didn’t really know anything about yoga. I mean, I know about it of course, but I don’t really know what it’s all about. I knew that yoga was a stretching and breathing exercise for people like me who have problems with being bitter and twisted. People who turn to alcohol as a form of relaxation as opposed to some aloe vera ice tea. But that was about it. There was only one other person was in the yoga hall. A small Chinese boy. He was must have been older than he looked as he was backpacking around India, but at a guess, I’d say he was about 12 or 9. Great. Me and a Chinese man in a Childs body. Both waiting to be reformed by yoga. And then I saw him. The Tutor. The Master. The Yogi person. I looked to the Chinese man-boy for answers, but he was on snapchat. Laughing maniacally at his phone. Unbelievable. I started to get little flutters in my chest. Not the ones you get when you have the evening to yourself, and there’s a bottle of sauvignon blanc in the fridge – but the sort of ones that you get when you think you’ve left your mobile phone on the roof of the car at the supermarket. Those flutters. Where were all the other Earth Mothers? Where were the Fathers with their bare chests and their huge feet with knobbly toes from too much crouching? None to be seen. Just the Ben Kingsley lookalike dressed up like Gandhi. With his eyes shut. Chanting. Still, I remained positive. I am after all an example of positivity. The tutor opened his eyes for a brief second, beckoning to me and the Chinese juvenile – who had just told me he was only there to kill time before his overnight bus to Agra – to come to the front. To come closer to him. To be as one. Or three as it were. Oh, God. I could kill a rum and coke right now. The smell of incense was starting to make me feel sick. I looked at the Yogi tutor who still hadn’t said anything in the way of a greeting and was instead, reaching for a wooden flute. There we sat. Him, cross-legged, nearly ripping the crutch of his pants. Eyes rolled into the back of his head. Pure white matching the colour of his flowing robes. Me, trying my hardest to push my chubby knees to the floor without tearing a muscle. Sitting unnaturally upright, my back killing me. Trying not to inspect my feet to see if I have a fungal affliction from the dirty showers in India. Him, still tooting on that bloody wooden flute. His eyes rolled up in his head. Joss sticks, millions of the things stinking the room out and making me choke. Why didn’t I just get up and make a run for it? I looked over to the wee man lad. He looked like he was getting something out of it. Nodding furiously at the wooden flute and smiling. I concluded that maybe it was a Chinese nursery rhyme. At last, the pied piper stopped and scanned the room. Obviously disappointed that the only people to witness his mini-concert was a student from Tawain and a confused woman with suspected athletes foot. I sat up straight. I had to stop myself from clapping. Don’t applaud you, idiot. People who come to yoga don’t applaud the flute player. They’re too in the moment. Silence. He said nothing. Just stared. And smiled. A cross between Budhah and Jack Nicholson in The Shining. I felt uncomfortable. This was awkward. I wasn’t sure if this wasn’t some sort of test. A cruel joke. Let’s see who breaks first. The old woman or the Chinese chimpanzee. Be calm Liz. Be serene. See through the eyeliner and into his soul. Don’t you dare clap or scratch your toe and definitely don’t start humming like you always do when you get nervous. I wondered how he kept the robes so white in such a dirty city. I found myself wondering whether I should buy a top loading washing machine when I got back to New Zealand. “Go Home,” said the smooth voice. The Yogi teacher. ‘Go home’ he repeated, this time the voice slightly impatient as he tilted his chiselled chin toward the exit. Still, I sat like a half-wit. A simpleton smile on my face. At least Chinese busboy had the excuse of not understanding English very well; he was still nodding furiously. But I knew precisely what the tutor meant, and still, I sat there waiting to fly up to the ceiling in my yoga pants and my knickers on my head. Enlightened and stretched in all directions for 200 Rupees. But I didn’t. I just flew out of that door like I’d been given wings. Straight up the dusty road, past the rip off coke kiosk and onto the roof terrace of our guest house. And there it was. The love of my life. The one that makes Mummy calm. The Indian rum and coke. Omg! Totally hilarious. Cannot wait for the next one. I’ve seen those “zen” families too, but it usually drives me to gin, not yoga lol. I love the way you tell the story. ? We just spent 6 months living 2 minutes from a wondrous yoga place in Hoi An. I vowed to go. 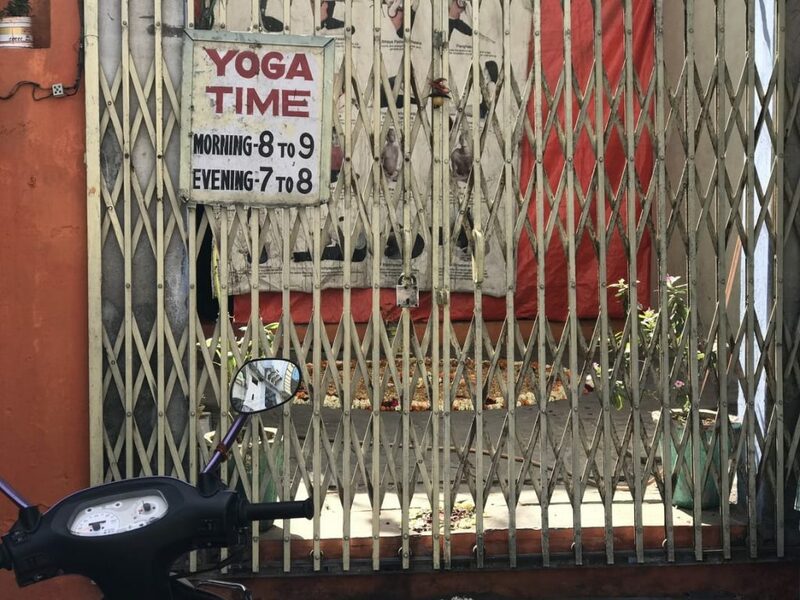 Unlike you, I have yoga-d before and yoga-d often, but did I go…NO. Why, because in Vietnam there is wine and yoga was at whine time, whereas running can be done at any time without fixed schedules. Therefore I ran. Take up running instead. Absolutely brilliant! Hahaha…..perhaps settle for the rum and coke after all? Kids eh? That perfect family must have been Dutch…definately. They are on every holiday we go on too…. ? Liz you are a bloody hysterical writer! Kids kept asking me why I was snorting and grinning at my phone. Can relate to all of it, except the flute thankfully, never experienced that. Loving your alternative India experience!!! I’ll have to start reading your posts in daytime instead of nighttime, Liz! I’m laughing so hard, I’m waking up the whole family. And if the smallest wakes again, I’ll have to get the rum and coke menu too! !